This month’s Kansas City Coalition for Digital Inclusion meeting was moved to May 12 to celebrate National Digital Inclusion Week. The KCCDI celebrated by holding a special 3-hour meeting with a panel discussion and Skype call to the National Coalition for Digital Inclusion to discuss the progress in digital inclusion, as well as mistakes and hurdles. 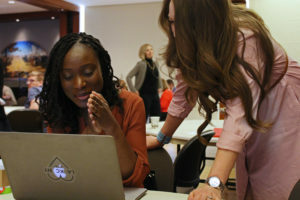 Though Digital Inclusion Week was a way to celebrate efforts made toward closing the digital divide, the meeting also focused on ways to improve those efforts and lessons that core activists have learned along the way. 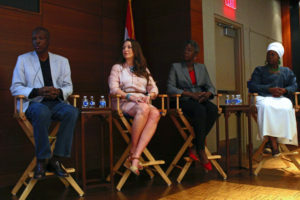 The first panel included Sarah Bell of Literacy KC, Ina Montgomery of Urban TEC, Kevin Patterson of the Kansas City Housing Authority, Rachel Merlo of Google Fiber and Sheridin Jones, a resident and volunteer of Kansas City Housing Authority. Kevin Patterson of the Kansas City Housing Authority found that demonstrating the value of technology was key to any kind of digital literacy. One of his senior residents didn’t understand the value until she was convinced to FaceTime with her son who lived across the world and who she hadn’t seen in three years. Once she saw his face and the face of her newborn granddaughter on an iPad screen, she was happy to learn the ins and outs of technology. And in order to demonstrate the value of technology, Sheridin Jones found that organizers and trainers had to truly understand why some residents don’t want to take advantage of digital literacy classes. After rearranging the dates and times of digital literacy classes, she wondered if residents weren’t coming because they simply didn’t care. Eventually, she found that residents were content using their smartphones and felt that surface-level knowledge of technology was acceptable. 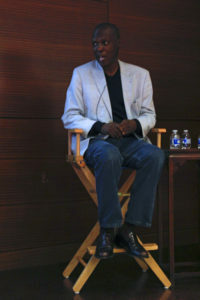 “Also, a lot of the residents are distrustful of things that are free,” Jones added. Trust was the final theme of the first panel. Coalition members may have lofty and noble goals, but unless they integrate themselves in the communities that they are trying to serve, they won’t gain trust or make any progress. 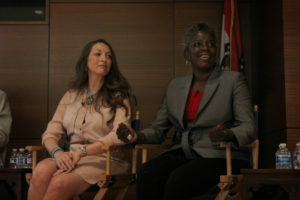 Dr. Mark Bedell, superintendent of Kansas City Public Schools, Brent Schondelmeyer of the Local Investment Coalition, and Debby Ballard, president of the Sprint Foundation. The panel focused on digital literacy for children, and the biggest theme to emerge was the importance of planned technological roll-out. Dr. Mark Bedell especially cautioned the slow and measured introduction of technology into public schools. He told a cautionary tale of another superintendent who didn’t consider the effect that introducing laptops and ipads would have on finishing homework assignments, the changes to teaching in the classroom and what processes would be involved in grading assignments. Without a measured and careful introduction, rolling out a large amount of technology just because it is available can hurt students more than help. Interested in staying up-to-date with other digital inclusion-focused activities and discussions? Digital Inclusion Community Awareness Day is June 17 from 9 a.m. to noon. Sign up for our e-newsletter for event details. One additional note: Ajit Pai, the chairman of the Federal Communications Commission, has agreed to come to Kansas City and talk about digital inclusion in the coming months, so stay tuned to our emails for more info. Attendees talk at the monthly Kansas City Coalition for Digital Inclusion meeting on May 12, 2017. Panel Discussion at Kansas City Coalition for Digital Inclusion meeting over Digital Inclusion Week. May 12, 2017.